Bath confirmed a Premiership play-off place after an enthralling game at Harlequins that saw the lead change hands eight times. 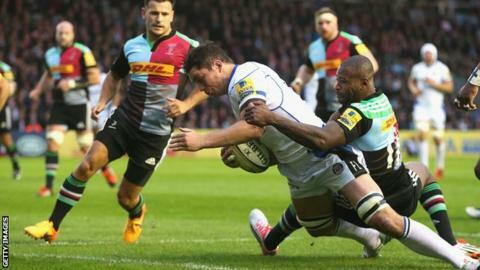 Quins winger Ugo Monye, on his final home appearance, crossed early on but Francis Louw responded for Bath. A penalty try gave Quins a 15-10 lead at the break, but Horacio Agulla and Leroy Houston touched down in response. Monye crossed for his second try in the corner before England fly-half George Ford's late penalty won it. The four points strengthens Bath's position in second place, as they face Gloucester at home on the final day of the season next weekend. Right from the outset it was an open match, as demonstrated when Marland Yarde's brilliant burst put in Danny Care and, as the scrum-half was dragged down short of the line, Quins spun the ball wide to Monye, to dive over for the dream start to his final home game before retirement. The hosts then lost Nick Easter to concussion, after which Bath's Ford slotted a penalty and was then involved in a flowing move with Kyle Eastmond and Leroy Houston than sent captain Louw in for their opening try. After former All Black Nick Evans slotted his first penalty, Quins' driving maul was too much for Bath and the pressure culminated in a penalty try, converted, for a five-point lead at the break. Bath continued to dominate possession and got straight in after the break when Argentinean winger Agulla hit a brilliant line to go over uncontested. Evans slotted two more penalties, but Bath's Houston latched onto a Sam Burgess off-load to power over as they retook the advantage. Almost immediately afterwards, Monye scored his second of the evening, showing a burst of speed and powering through Anthony Watson to finish smartly in the corner. But Evans's missed conversion proved costly, as Ford kept up his perfect kicking record with a late penalty to seal the win. "His first try was a finish but he had started the game really well. "His second try - what a finish. That was just raw power. And I also like the way he stood up when Sam Burgess unloaded on him. He is very special. "I'll do well to get him on the pitch against Newcastle next weekend because he seemed to enjoy his swansong. He had a big bottle of champagne with him." "Quins played very well and kept coming at us, but we kept our composure and didn't panic at any stage. "Matt Banahan's try-saving tackle on George Lowe was crucial, George Ford kicked his goals and we take the four points and move on. "Going into the last game of the season we know that a home win will secure us second place. "We're very pleased because it just adds to the belief we have at the moment that we're a good side and could potentially win this year." Harlequins: Lindsay-Hague; Yarde, Lowe, Sloan, Monye; Evans, Care; Lambert, Ward, Shields, Easter, Robson, Wallace, Robshaw (capt), Clifford. Replacements: Buchanan, Adneiran-Olule, Marfo, Matthews, Talei, Dickson, Botica, Walker. Bath: Watson; Agulla, Joseph, Eastmond, Banahan; Ford, Stringer; James, Batty, Wilson, Attwood, Day, Burgess, Louw (capt), Houston. Replacements: Webber, Auterac, Lahiff, Garvey, Fearns, Cook, Devoto, Homer.